MICHELL says its new OptiPEAK TDL600 moisture analyser’s fast response and non-contact spectroscopic measurement principle ensures that gas storage companies are able to not only meet demand quickly but also satisfy the contractual standards for moisture content when stored natural gas is withdrawn and injected to the pipeline network. Storing gas is an integral part of the natural gas industry because the timescales for consumption and delivery do not match the time needed to extract, process and transport the gas. In order to ensure an uninterrupted supply to consumers, quantities of gas are usually stored underground. 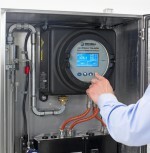 The water dew-point temperature or moisture content of the stored gas is measured during the filling (pressurisation) and usage (de-pressurisation) cycles. Storage pressures of up to 30 MPa require the gas to be very dry in order to prevent condensation occurring. Four fast response, medium wave infra-red (IR) heating modules from HERAEUS NOBLELIGHT are helping Tarkett to significantly reduce the danger of flooring product manufactured at its Maidstone factory being spoiled or damaged in the event of unanticipated power cut-out or unexpected stoppage of the production line. The new MDM50 portable hygrometer from MICHELL INSTRUMENTS is said to give rapid dew-point measurements in compressed air – T95 to -35°C from ambient typically in less than 5 minutes. 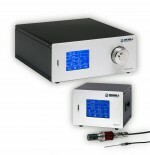 It has been designed to make spot checks of dew point in air and gases as simple and fast as possible.